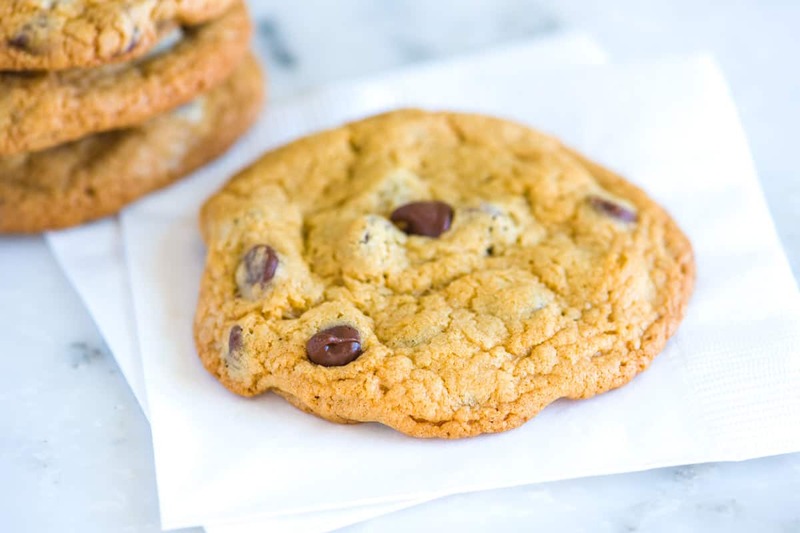 How to make the best homemade chocolate chip cookies. This easy recipe makes cookies with crisp edges and chewy middles. Jump to the Chocolate Chip Cookie Recipe or watch our quick video below to see how we make them. We cannot get enough of these cookies. There’s a good bet that you’ll find a big bag of cookie dough in our freezer right now. Definitely check below for our tips on freezing cookie dough. Once you try one of these chocolate chip cookies, you will fall in love. WATCH: How to make our Easy Double Chocolate Chip Cookies from Scratch. Below, we share our best tips for making big, chewy cookies as well as how to make them ahead of time. These homemade cookies are easy to make. We prefer to use our stand mixer, but you can also make these cookies with a handheld mixer. Start by creaming butter, sugar, and vanilla extract together. We use granulated sugar and brown sugar in this recipe. The granulated sugar makes the edges crispy and the brown sugar keeps them chewy and tender. You will need room temperature butter. Here’s a tip: If you forget to take the butter out in advance, remove it from the packaging and cut into small pieces. Spread them out onto a plate. After 15 to 20 minutes, the butter will have softened. Once the butter, both sugars and vanilla are light and fluffy, it’s time to add eggs. Room temperature eggs are best since they incorporate better into the batter. Don’t have room temperature eggs, no problem. Fill a bowl with warm (not hot) water and submerge the eggs into the water. After a few minutes the eggs will be the correct temperature. The dry ingredients come next — just flour, baking soda, and salt. And finally, the chocolate. Use chips or chunks and play around with what kind of chocolate. We love bittersweet chocolate chips, but semi-sweet, milk, or a combination are all delicious. At this point you can bake, chill, or freeze the cookie dough. The dough will keep in the refrigerator up to 3 days. Even though you can bake straight away, chilling cookie dough actually makes better cookies. As chocolate chip cookie batter chills, it improves. A night or two in the refrigerator helps the flour absorb moisture in the dough from the egg. This makes the cookies even more chewy, thicker, and they taste even better. You can also freeze the dough. I mentioned above that we keep frozen dough for cookie cravings. Prepare the cookie dough as usual. 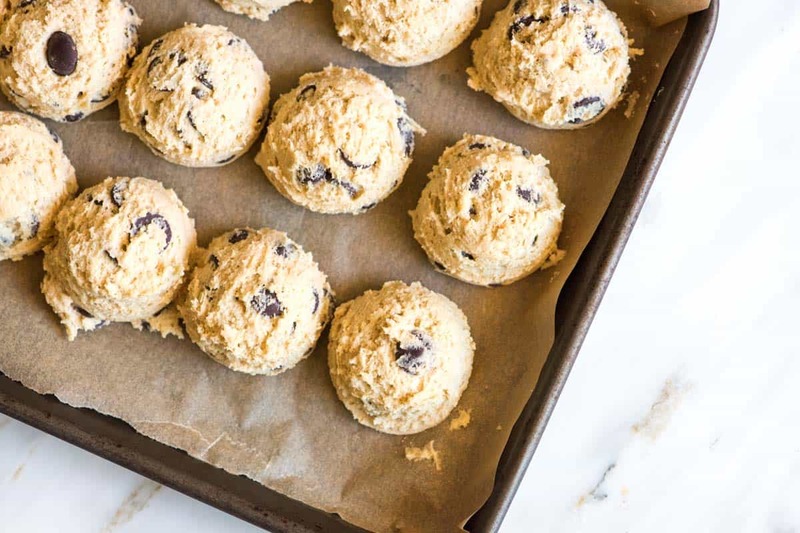 Scoop out cookie dough mounds onto the baking sheet. You can crowd the cookie mounds together, just do not let them touch. Transfer the frozen dough mounds to an airtight container or plastic bag. Store in the freezer up to 3 months. Then, when a craving hits, bake the frozen cookies without thawing. It will add an extra 3 to 5 minutes of bake time. 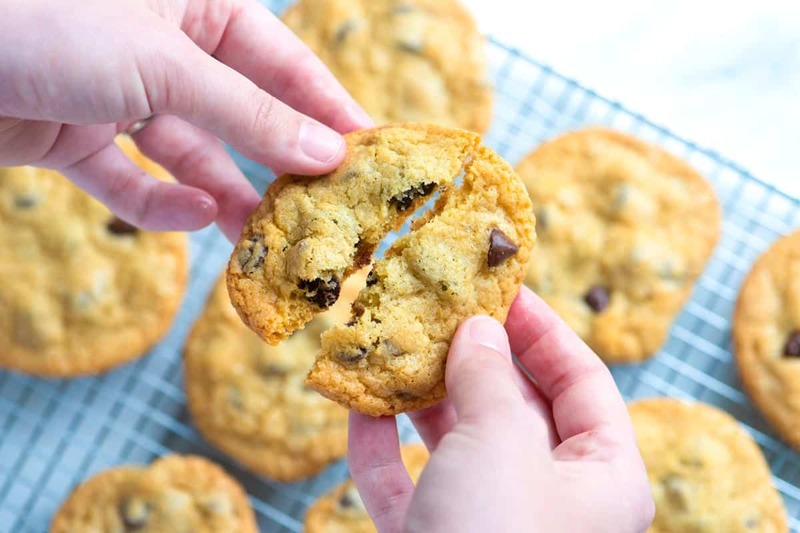 These easy chocolate chip cookies have the right balance of crisp edges and chewy middles. We prefer using our stand mixer, but you can use a handheld mixer if that is all you have. We love to use bittersweet chocolate chips since they are not as sweet. Semi-sweet chips are also a great option. Position a rack in the lower third of the oven. Heat the oven to 350 degrees F. Line two baking sheets with parchment paper or use a silicon baking mat. Add the butter, both sugars, and the vanilla to the bowl of a stand mixer fitted with the paddle attachment. (Or, in a mixing bowl, using a handheld mixer). Cream the butter and sugars together on medium speed (speed 4 on our mixer) until light and fluffy; 3 to 5 minutes. Scrape the side and bottom of the bowl then add the eggs. Mix on medium-low speed for 30 seconds. 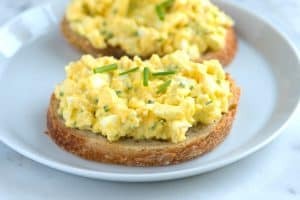 The eggs will not be completely incorporated. Turn the speed down to lowest setting and add the dry ingredients in thirds, beating until just combined; 1 to 2 minutes. With the mixer on low, sprinkle the chocolate chips until just incorporated. Drop 3 tablespoon-mounds or use a large cookie scoop onto baking sheets. Leave 2 inches between the cookies to allow for spreading. Bake the cookies, one sheet at a time and rotating once during cooking, for 15 to 18 minutes. The cookies should be golden brown around the edges but light in the middles. Let the cookies cool on the baking sheet for 2 minutes then transfer to a wire rack to cool completely. Store the cookies in an airtight container for up to 3 days at room temperature or up to a week in the refrigerator. Make Ahead Tip: Refrigerate unbaked cookie dough up to 3 days. Or, freeze cookie dough up to 3 months. How to Freeze Cookies: Line a baking sheet with parchment paper and prepare the dough as usual. Scoop out cookie mounds onto the baking sheet. You can crowd the dough mounds together, just do not let them touch. Freeze until hard. Transfer the frozen dough mounds to an airtight container or plastic bag. Store in the freezer. Bake frozen cookies without thawing, it will add an extra 3 to 5 minutes of bake time. Make Smaller Cookies: Drop 1 1/2 tablespoon mounds or use a medium cookie scoop onto the baking sheet. Bake for 9 to 13 minutes. Recipe adapted and inspired by The Back in the Day Bakery Cookbook and the Nestle Original Chocolate Chip Cookie Recipe. Hello Joanne, first off. These cookies look super amazing & delicious. I was just wondering… what if I only have a medium cookie scooper? Does it matter the time I leave them in? Hi Amanda, The cookies will be smaller and will likely need less time in the oven. Go by visual cues — the cookies should be light brown and look dry on top and golden around the edges. Hi i made these today for the first time and very pleased with the outcome. I did find them a bit sweet, could i cut both sugars to half a cup instead of the full cup.? Thank you for the extra tips..
Hi Ann, You can cut the sugar, just keep in mind that this will not only reduce the sweetness of the cookies, they will spread less. The texture will be slightly different, too. Hi again, I have continued to make them your way and they are really the absolute best, also tried the double chocolate cookies, absolutely amazing.. thank you for sharing. hi Joanne and Adam, I’m a great fan of your website and have tried a number of your recipes and made quite a success on most occasion. For this recipe , taste-wise i got it! however, i failed to achieve the same rough texture/look of the cookie. Mine is a bit smooth on top and the bottom part is almost toasty. I followed baking instruction to a T, including temp and bake time. Any tips or corrections i need to do? Thanks much! 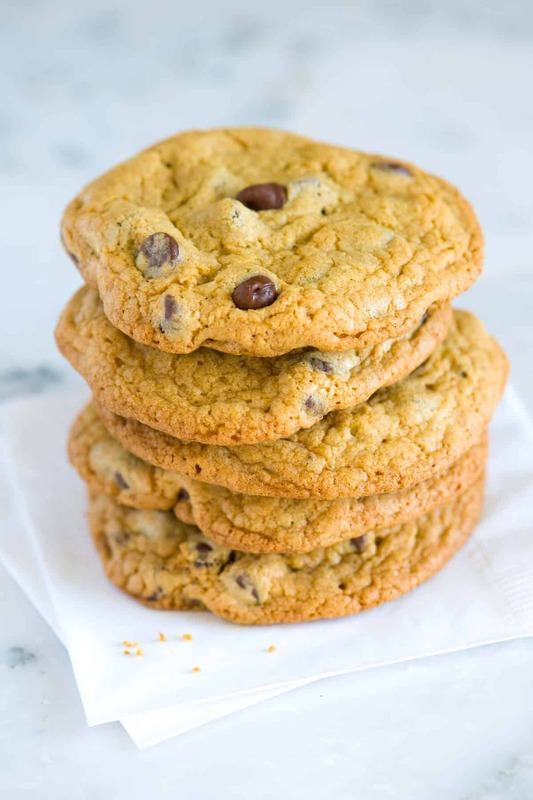 I love cookies and watching your video of the chocolate chip cookies, I would like very much to try. However, I am lactose intolerant, hence cannot take any diary product. 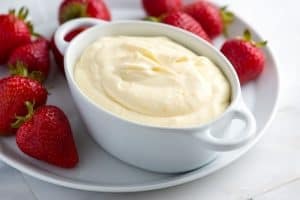 Can I replace butter with corn or vegetable oil? If so, the measurement please.Thank you very much and I hope to hear from you soon. Hi Anna, You might be able to replace the butter with coconut oil, but since I have never personally done this, I cannot say it will work out as well as when butter is used. Hi, what is the brand of your cookie scooper? Hi Mila, I believe this one is from OXO. hey perfect! quick n easy to make. thnx for sharing! Hi Joanne and Adam, once again you have shared with us a perfect recipe. I made these last night, using half the ingredients for half a batch. I only used brown sugar (I didn’t have granulated sugar on hand) and they were DELICIOUS. 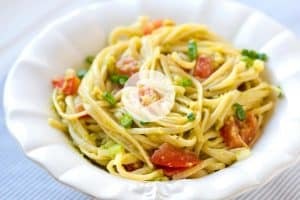 Thanks for sharing another simple, easy to follow recipe!